Last week I mentioned my weird, flawed, sinful aversion to owning a minivan. As I mentioned in that post, owning a minivan would make me feel incredibly marmish, and with my cardigan-love I am already too close to marm-ville for comfort. I will ride in one all day long (comfy, logical, and efficient; I'll give them that); however, I don't want to buy one. Tons of my friends drive minivans--and love them--but I still fear them. I just know what so many people have told me: Once you go minivan, you never go back. Before I explained that it was a church van we were using for a weekend trip, TONS of people congratulated me for biting the bullet, saying I'd love it and, of course, never go back to a regular car. I can't say that I fell head over heals for a minivan this weekend, but I can definitely see where they might be useful. Just not cute. I can get over that fear if necessary. My SUV, which I LOVE, is awesome. It's the type of car I will never get to drive again, and I don't want to give it up...BUT it has almost 200K miles on it, and we need to think about buying a different family car. Here's what we need: Reliability, great gas mileage, large capacity, ease of use, a powerful engine, and safety. And cuteness, obviously. We will NOT be getting a loan to buy a car (Dave Ramsey rules. ), so we need to purchase this vehicle as wisely/cheaply as possible. 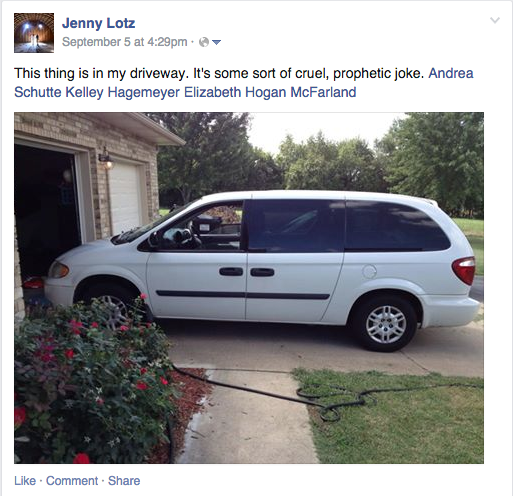 **UPDATE** I escaped Marm-vile by the skin of my teeth when we bought a "not minivan." Details here.